"Advance Wars is a turn-based tactics video game developed for the Game Boy Advance by Intelligent Systems and published by Nintendo in 2001. It was released in the USA on September 10, 2001, but put on hold in Japan and Europe due to the following day's terrorist attacks in the USA. Although released in Europe in January 2002, neither GBA game was released in Japan until the Game Boy Wars Advance 1+2 compilation on November 25, 2004. 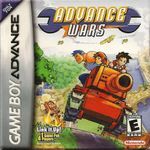 Advance Wars is the first game in the Advance Wars series of video games, followed by Advance Wars 2: Black Hole Rising (also for the Game Boy Advance), and then by Advance Wars: Dual Strike and Advance Wars: Days of Ruin for the Nintendo DS. These games form a sub-series of the Nintendo Wars set of games." Source: Wikipedia, "Advance_Wars," available under the CC-BY-SA License.